Bride & Groom Chocolate Pretzel Rods. Chocolate Store, the online candy store with chocolate and candy. 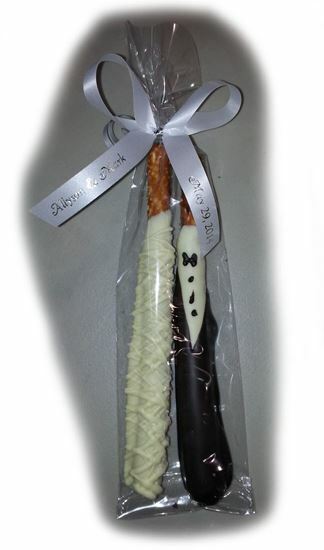 Just the two of us...Bride and groom chocolate covered pretzel rods are perfect for a wedding or bridal shower favor. Our hand decorated bride and groom chocolate covered pretzel rods are perfect for a wedding or bridal shower favor. Handcrafted with real dark and white chocolates. Packed 2 per bag. Each pretzel rod is 7 to 8 inches long. Can be personnalized with imprinted ribbon and or sticker.